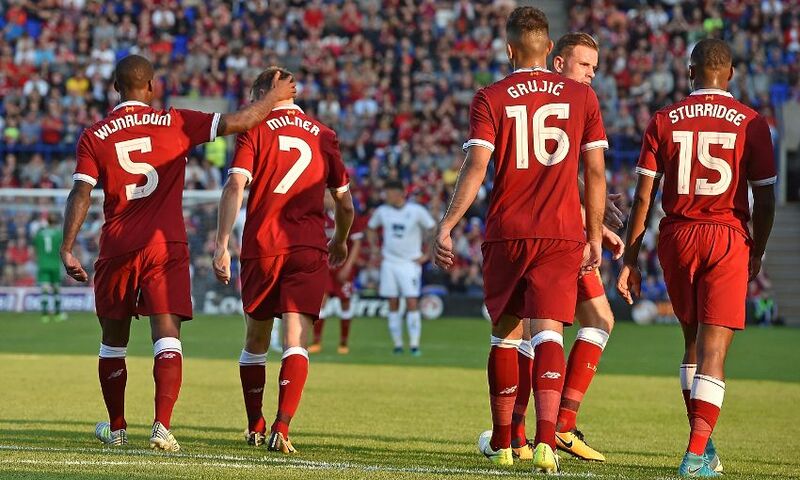 Liverpool kicked off their pre-season campaign with a 4-0 victory over Tranmere Rovers at Prenton Park on Wednesday night. A penalty converted by James Milner and Marko Grujic’s fierce hit from distance gave the Reds the kind of lead their first-half performance deserved at the interval. Pedro Chirivella, one of 10 players introduced in the second period, quickly added to the scoreline with a straightforward rebound and Ben Woodburn sealed the win by earning and scoring another spot-kick. The headline news in the starting line-up was the first appearance since February for Jordan Henderson in midfield, while the likes of Roberto Firmino, Milner, Daniel Sturridge and Georginio Wijnaldum began the game too. There was little sign of rustiness from either side in the earliest exchanges and attacking intent was obvious in either direction, though more towards the Tranmere net. Liverpool should have translated that brightness into an opening goal on seven minutes, but Joel Matip miscued his close-range finish after Lucas Leiva flicked on Milner’s corner. Sheyi Ojo was lively as he used a licence to drift into shooting areas from each flank and, having previously clipped off target from a promising position, next saw a decent effort deflect away en route to goal. The pressure steadily mounted on the home team as the half progressed and, with 28 minutes played, Rovers required a crucial double intervention to keep the Reds out. A well-struck blast from the edge of the area by Grujic was palmed out by Scott Davies and Steve McNulty recovered in timely fashion to deny Sturridge the rebound. But the breakthrough soon came for Klopp’s men. Ojo was alert to a loose ball inside the box and tumbled under the challenge of goalkeeper Davies when he reached it, presenting Milner with a chance to swipe in a penalty and put Liverpool ahead. And their advantage was doubled three minutes before the break, Grujic producing an outstanding strike that dropped into the far right corner from around 25 yards out. Klopp made 10 changes to his team during half-time, with only Loris Karius retaining his place for the second half of the players that lined up at kick-off. The momentum continued, though, and Chirivella had already threatened with a delicate dink at goal before he did claim a third for Liverpool. When summer signing Dominic Solanke’s low shot on the angle was parried by the ‘keeper in the 50th minute, the Spaniard sped towards the ball to seize upon a simple tap-in for 3-0. Chances came and went as time petered away but there was to be a fourth for the Reds after Woodburn was fouled as he bore down on goal 11 minutes from full-time. The Welsh youngster took command of the spot-kick and sent the ‘keeper the wrong way with a calm stroke to the right, adding gloss to a solid evening’s work for Liverpool.